It's no secret that former President Obama and Vice President Biden shared a "bromance" while in the White House. They even had memes go viral -- to the point where Biden has seen them. Now that they're out of the White House, though, are the two still friends? According to Obama's chief of staff, Anita Decker Breckenridge, yes. "The bromance continues. It's not ended," Breckenridge told PEOPLE. "That's one of the things I would say, you know ... What does he miss about the White House? I mean, they had lunch every single week for eight years." A weekly lunch for eight weeks amounts to 416 lunches, according to Refinery29. 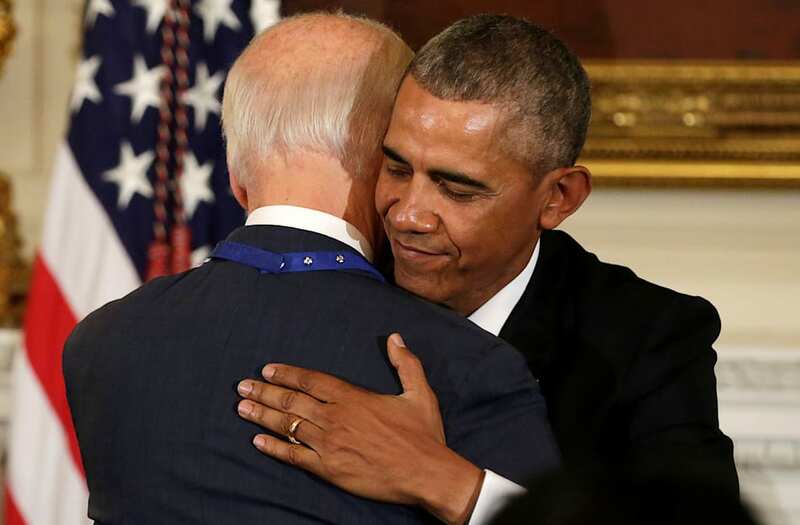 After President Trump's inauguration, the first time Obama and Biden saw each other was to christen the Obamas' new offices in Washington D.C.
"The vice president walked in and he and President Obama embraced and then immediately clicked back into the relationship they had working together," former White House press aide Peter Velz told PEOPLE. "It was really nice to see, just how warm the vice president's reception was." The gathering was complete with a cheese platter and wine on a folding table. The two have also gotten together to play golf.